Why would you want to create a browser toolbar? If you already use one like Google Toolbar, you know how helpful it can be to have easy access to search and bookmarking capability. For the toolbar creator, the idea is to help you connect with your blog readers much like adding a MyBlogLog widget to your blog can help foster a sense of a reader community. You might think it's really difficult to create a toolbar, but Conduit has made it easy to create a custom toolbar for Firefox and Internet Explorer. 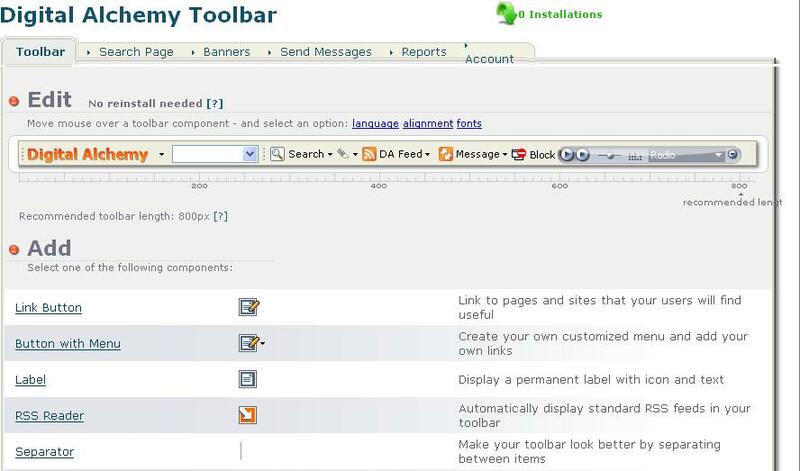 In four steps, you can create a toolbar to rival Google and Yahoo. You can add elements like a search box, RSS feed, email notifier, pop-up blocker, and music radio. 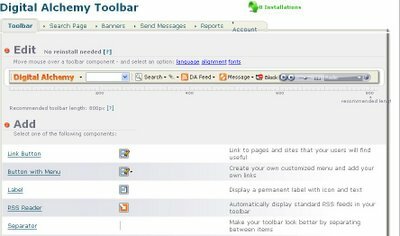 A demo Digital Alchemy toolbar can be downloaded here. Interestingly, you can also add a message element that lets you send updates or notices directly to your readers via the toolbar. Like Google Toolbar does, it's a way to subtly remind your users of your blog, or conduct a search in Google's case. Another good feature is that any updates you make to the toolbar are automatically pushed to your toolbar users. No reinstallation necessary. My users are complaining that the conduit toolbar technology asks them if they want to change their homepage - have u got a workaround for this? I bet Conduit is making lots of money from their search bar! I found Toolbar Studio, but it seems that they are quite expensive and used for corporates.